It started off a bit stressful since during setting up it became apparent I had no internet connection. Pretty much the only thing you really need during a hackathon and quite ironic after having badgered everybody to make sure they register their MAC addresses. So much for presentations on Google docs as well. After some futzing around with eduroam and passing around laptops we finally got things in order and started just half an hour behind schedule. After thanking the sponsors (see below) and an introduction from me we got around to the problem statement presentations. Tim Davies from RHoKOxford and Practical Participation fame presenting an IATI related problem. 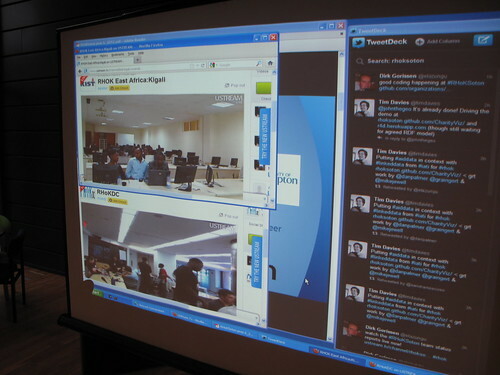 We had a number of very interesting problem proposals, with some even pitched via Skype from South Africa. We had Taarifa there of course as well as a local problem from the University of Southampton Geography department: Development of an operational water stress product from satellite imagery. After the pitches it took about an hour for people to congregate and settle around their chosen problems. In the end we had 5 teams and soon everybody was hacking away furiously or busy drawing architecture diagrams on large sheets of paper. 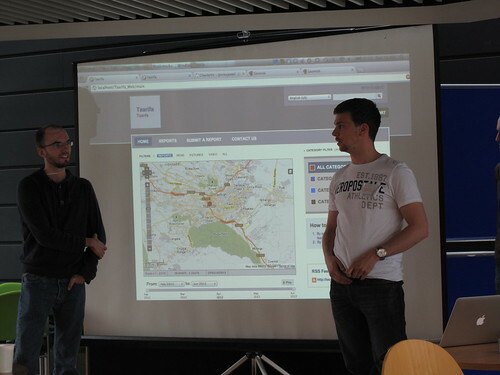 The global RHoK event consisted of 26 cities around the world all going through the same process. The cool thing was that each had its own dedicated ustream channel which meant we could tune in to other events and watch how things were going there. We also had a global hangout with multiple locations which, though a bit chaotic, was great fun. 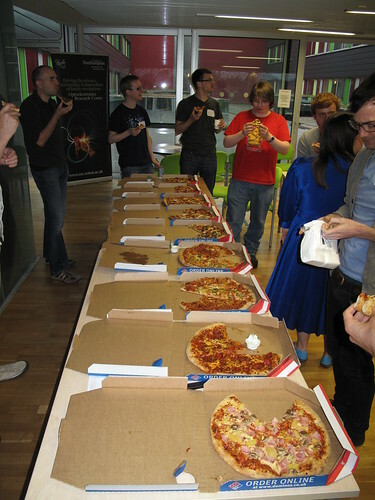 By 6pm pizza duly arrived and was quickly consumed so hacking could continue. A couple people even continued straight through the night. One of those being Sam Wilkinson who was designing circuit schematics for sensor probes that would plug into the audio jack of a smartphone. Sam in front of his makeshift bed where he slept for a full 1.5 hours. Sunday morning was very calm and quiet as people concentrated fully on ironing out bugs and getting prototypes working. After another round of pizza and a live Skype tour of the Tendale market in Dar es Salaam in Tanzania by Mark Iliffe it was time for final presentations. After about an hours worth of presentations it was time for the exciting bit. Instead of having a number of formal judges we decided to do it in a more democratic way and use a Google form to allow everybody to give feedback on the other teams. Scores were then aggregated and averaged. This actually worked very well and the winner at the end of the weekend was team CharityViz! A jQuery plugin for easily displaying and integrating IATI data. The second place was captured by WaterMe and the third place by Taarfia. 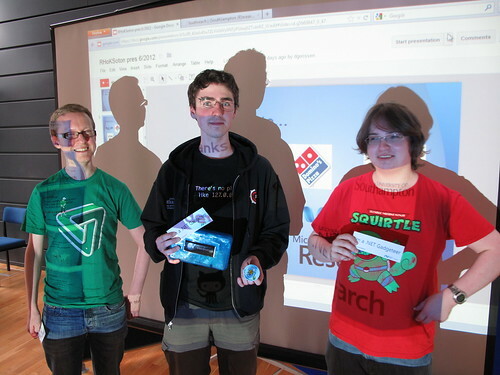 Team CharityViz winners, Mike Jewell, Dan Palmer, and Thomas Grainger. Congrats to all! Congrats to all those involved! The top three teams got Github subscriptions and CharityViz walked away with a great Gadgeteer kit, kindly donated by Microsoft Research. It was amusing to see everybody excitedly open up the kit and inspect the different electronic components and plugins. 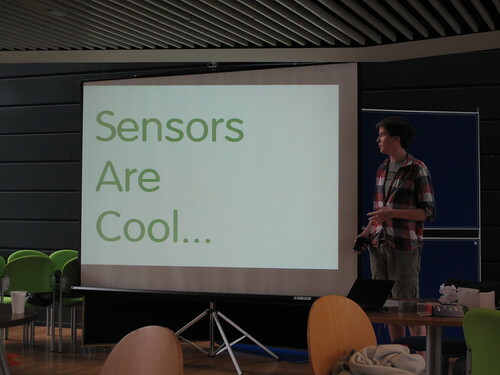 The code for all projects can be found under the RHoKSoton and Taarifa Github pages. Patches encouraged! Looking back on the event I’m very happy with the way it went and the many smart people involved. I do hope the momentum continues on the various projects. Feedback was very good and it looks like we shall be organizing the next one in December as well! Top notch event. 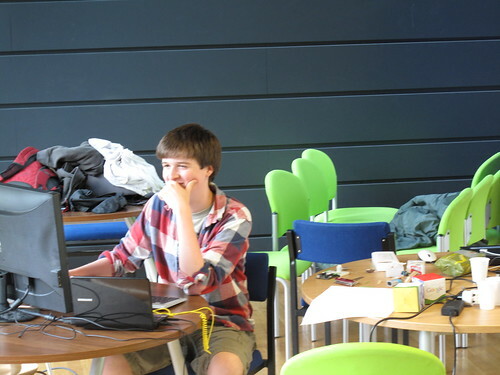 An ideal local opportunity to contribute IT skills to worthy community projects. 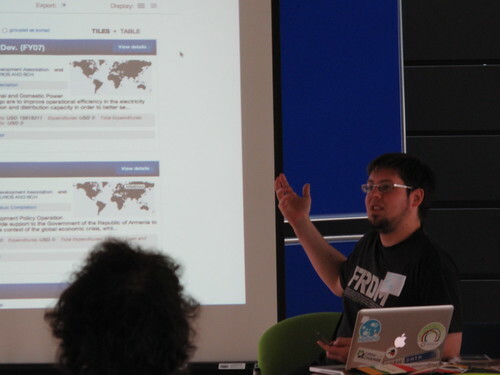 *** has returned stronger in his determination to progress social computing and full of praise for both this event and the folk who organised and contributed (Domino’s Pizza high up there too!). Good luck with all you aim to achieve.